The president and CEO of the Federal Reserve Bank of Dallas told business leaders that unemployment and education should be viewed apolitically to avoid risking Texas and the rest of the country becoming less competitive. SAN ANTONIO — If policymakers and elected officials keep buying into the misnomer that trade and immigration are the keys to job loss, the state’s and country’s leaders are going to craft policies that hinder growth and prosperity, the president and CEO of the Federal Reserve Bank of Dallas told business leaders in San Antonio. Kaplan said instead business and education leaders should look at the issues of unemployment and education through an apolitical lens if they don’t want to risk Texas and the rest of the country becoming less competitive. "We have a big skills gap, not only in Texas but in the United States. This is a big problem because every one of these jobs that goes unfilled [means] lower GDP, lower productivity, lower prosperity," he said. “If we get that diagnosis wrong, for obvious reasons, we’re going to make very poor policy decisions, which will cause us to grow less quickly than we would otherwise." Kaplan also touched on the North American Free Trade Agreement and how further discussions over how to modernize the 1992 trade deal will spill into next year. Mexico’s constitution allows a president to serve one six-year term, so negotiations could take on a new dynamic during Mexico’s 2018 election season if voters rally around a candidate who has different views on NAFTA than current President Enrique Peña Nieto. It’s especially noteworthy for Texas because trade with Mexico is predominantly intermediary, Kaplan said. That means some goods and products pass back and forth between the two countries several times. “That is different than the trade relationship with China. So it pays to segment the trade relationships and think about them in a very strategic way,” he said. Texas would be the most-affected state if NAFTA is reworked in a way that decreases trade between the two countries. From January to August of this year, more than $366 billion in two-way trade has passed through ports in the United States and Mexico, according to WorldCity, a Florida-based economics think tank that uses U.S. Census data to track trade patterns. That figure represents a 5.85 percent increase compared to the same timeframe in 2016. 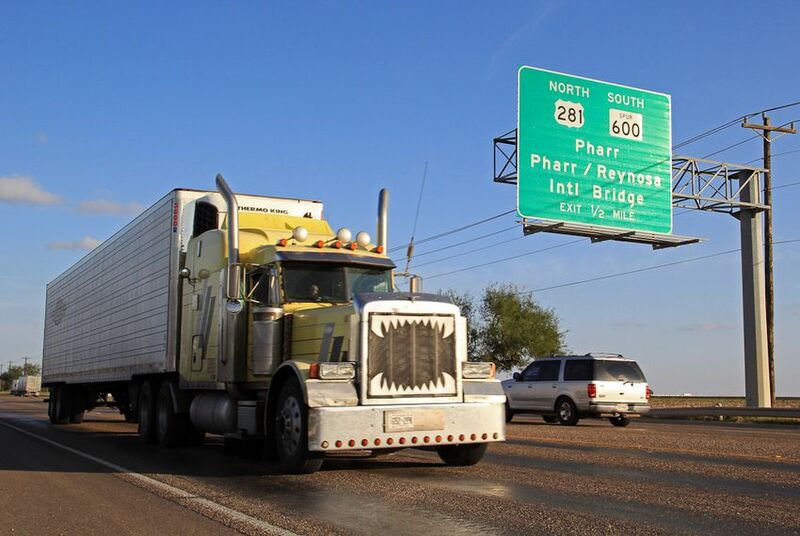 About $193.4 billion of 2017’s trade has passed through the Laredo customs district, with another $61.5 billion passing through the El Paso customs district. The ports of Houston and Port Arthur are also in included in Mexico’s top 10 trading partners, ranking fifth with $13 billion and eighth with $3.5 billion, respectively. On Hurricane Harvey, Kaplan said the Federal Reserve Bank of Dallas estimates the costs of damage to homes ranges from $45 billion to $55 billion and damage to businesses is between $15 billion and $20 billion. He said that means the affected areas, especially Harris County, will need an influx of workers to rebuild — causing concerns for leaders because of the current debate over unauthorized migration. He said the bank estimates that as many as 50 percent of the construction workers in Harris County are undocumented.